You walk out of a building over to where you think you parked your car, but it’s not there. Your first instinct may tell you it’s been stolen, but if you parked in a questionable spot it’s more likely that the vehicle has been towed. So, what do you do now? First, you’ll need to find out where your car has been towed to. If you were parked in a private lot, look around for a sign. 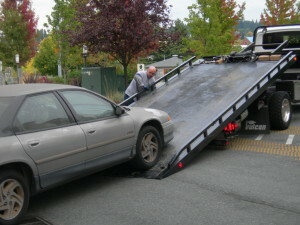 Often, towing companies leave their contact information in private parking areas. You can also ask a lot attendant or nearby business which towing company usually handles this area. If you were parked on a city street or private driveway, you should contact the police department (not 911) to inquire about the towing. Generally, if you’re unable to pay for the car to be released you have up to two weeks to remove any personal belongings from inside. After that, you’ll need to pay the bill in full to get anything from the car. However, these specifics could change based on your locality. For definite rules, contact the towing company or police department.